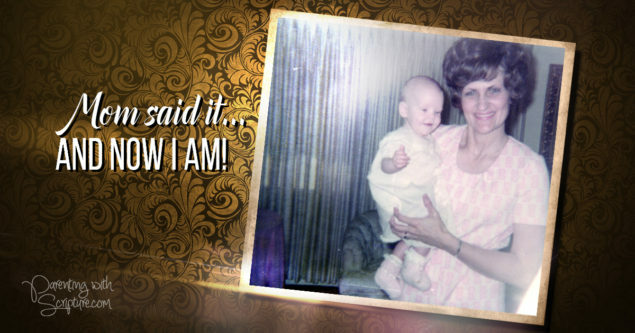 Generational Sayings- My Mom Said it…Now I am! Can you identify? Sometimes that can be good or bad! Thankfully, I had an AMAZING mom who had lots of nuggets of wisdom! I’m grateful for the ones that stuck and am excited to share them with you. Scroll through this link to read about these sayings and feel free to adopt the ones you like…I certainly have! What generational sayings do you find coming out of your mouth? If you think of any that are blessings to you, be sure to thank your mom this Mother’s Day! If you didn’t have the privilege of a mom saying things you would want to repeat, remember that you are a new generation! You have a chance to start fresh with your kids! Don’t look back and regret…look forward and be the change!